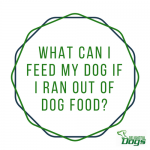 While a great diet is very important, knowing what you can and cannot feed your dog is extremely important. Some of these foods will cause serious injury, long-term and short-term problems that will require vet visits, and possibly even death in small and toy breeds. Unfortunately, there are thousands of lists on the internet claiming that certain foods are toxic when they are not. The items on this list are scientifically proven to be unhealthy or even toxic to Rover, and you should not feed them anything on this list for any reason. Keep it locked away in a cabinet that your dog cannot get into. Have you ever seen the videos of dogs getting into all kinds of things while their parents are away? Yeah, dogs are smart, they will figure out how to get into something if you are not careful. First on the list is alcohol. This is a no brainer. Dogs should not be drinking wine with you while you cuddle up watching your favorite shows. This is not being counted as the actual list, but just know that you cannot fill up Fido’s water bowl with beer. Avocados – these little delicious fruits are very poisonous to some animals, including birds, rabbits, horses, and others. They will cause death in birds because of the cardiovascular damage they inflict. Scary! With dogs, they may cause death in small and toy breeds, so do not feed them the left-over guacamole! Caffeine, Chocolate, and Coffee – All these substances have methylxanthines, which cause serious stomach issues like diarrhea, vomiting, abnormal heart rhythm, tremors, hyperactivity, overactive bladder, and sometimes even death. Dark chocolate is significantly more toxic than other chocolates. White chocolate is the mildest, while baking chocolate has the most toxins in it. Raisins and Grapes – These fruits we have as part of our regular diets can be the foods that cause your dog’s kidneys to fail. While kidney failure can be treated, it sometimes can be very fatal, and at the least, very expensive vet visits. Yeast Dough – While you are baking, it may be normal to throw your dog some scraps or take your eye off something on the counter. Yeast dough rises, that is the point of it, and when a dog eats it, it rises and will bloat and twist their stomachs, while immediately turns into an emergency situation for which the dog will need surgery. 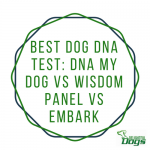 The yeast also produces Ethanol when it is broken down, and this will cause your dog to become drunk, which will lead to other symptoms like vomiting, lethargy, diarrhea, loss of coordination, and other symptoms. Anything Salty – Dogs get the required amount of salt in their normal diets. An over-consumption of salt from snack foods, chips, popcorn, or pretzels causes fevers, depression, vomiting, seizures, diarrhea, and even death. If your dog gets a regular salty diet, stop giving these things to them immediately, because you are slowly killing them if you are. 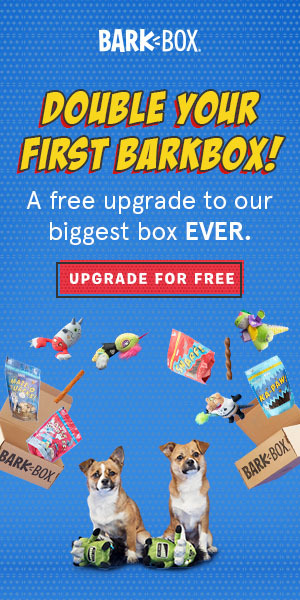 Those are the worst foods you could give a dog. There is no reason a dog should ever have the foods above at any time. As pet parents, it is your responsibility to keep your place clean, keep your dog away from foods that can harm them, and to educate your family and friends on the foods that are toxic to Rover, so they do not accidentally harm your dog. There are other foods that are toxic to your dog, but are less significant, and are not deadly. However, feeding your dog these foods can cause them to have a lesser quality of life, sickness, and expensive vet visits. Coconut – These fruits, along with coconut oil, can cause vomiting and diarrhea if ingested by your dog. 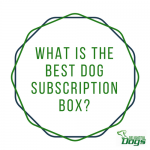 Although it is not highly toxic, and once it moves through your dog’s system, they will be fine. Macadamia Nuts – These nuts will cause a series of scary symptoms of mild poisoning including vomiting, weakness, loss of coordination, depression, tremors, and hyperthermia, which is a dangerously high body temperature. The symptoms only last for a day or two, and it is not usually fatal, but in very small breeds, it can be, depending on how much they ate. Dairy Products – Humans consume lots of dairy and it is actually good for us because we possess the enzyme known as lactase, which breaks down lactose found in dairy products. Dogs do not have that enzyme present in their bodies, so when they ingest dairy, their stomach turns sour, which causes vomiting, diarrhea, lethargy, and other symptoms. These problems go away anywhere from a few hours to a couple of days, depending on how much they ate or drank. Nuts – All types of nuts are high in oil and fat, which really upsets a dog’s stomach. They will have vomiting, diarrhea, and if an owner feeds a dog regularly, it can even cause pancreatitis. Onions, Chives, and Garlic – These herbs and veggies are very good for us, but bad for dogs, because of the irritation they cause in a dog’s gastrointestinal system. It even leads to damage to red blood cells. Cats are particularly susceptible to poisoning from these sources, but dogs are more at risk if a huge amount is eaten. Again, small and toy breeds are especially at risk for eating foods like these. These foods still could be fatal to them. Another dangerous food you could give any pet is raw meat, eggs, and bones. Raw meat, especially chicken and fish, should never be eaten, because they have a high chance for containing harmful bacteria like E. coli and Salmonella. Also, giving your dog raw bones can be harmful because of the bacteria and the risk of bone splinters. 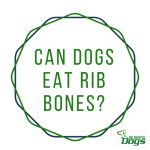 If you get your dog bones, get them from the pet store, and educate yourself on the harmful risk factors involved with each brand. Never give a dog a cooked bone. They are soft enough for your dog to completely destroy, but hard enough to splinter into very sharp pieces that your dog will swallow, which will puncture the esophagus, stomach, or intestines, which can cause internal bleeding, or even death. Surgery will be needed to remove the object. Raw eggs can contain harmful bacteria as well. Make sure you cook the eggs before feeding them to Fido. Your dog depends on you to give him/her food every day. Be sure that you know what foods you can give them so that they have a happy and healthy life. 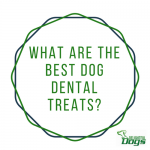 When in doubt, stick to delicious doggy dental treats! 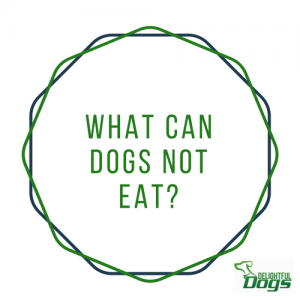 Infographic: What Can Dogs Not Eat?